Contemporary arch leg side chair. 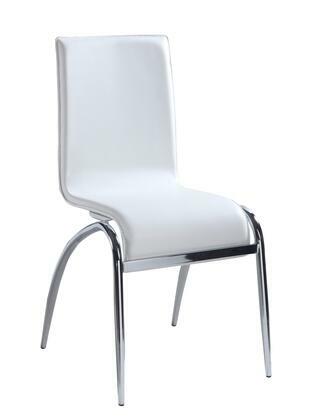 Retro look with Black, White or Red PVC upholstered chairs with arch legs in chrome finish. Nice materials chair from Chintaly for breakfast with messy grandchildren as they wipe off with a moist cloth and don't spot or fade. Elaine Collection chairs are really cute and look nice at my kitchen counter. I just finished putting together these beautiful chairs, and it was a very easy task. They are beautiful. The seat is firm, yet very comfortable and soft. They look exactly as they do in the picture and suit my open plan apartment perfectly. I have already recommended Elaine chairs from Chintaly to friends and I may purchase a couple of extras to have when friends come for brunch. Good chairs that look nice and are both sturdy and comfy. Give them a try, you won’t be disappointed. Great purchase from Chintaly. These chairs look high quality and you will save hundreds over other retailers. Went well with the table I have and don't take up a lot of space. The wife loves them and it did not break the bank. Delivery was fast and the shipping boxes showed no signs of damage. I am very satisfied with the quality of the chairs. I was a little leery of ordering furniture online, but the quality and accurate descriptions of these chairs eased those concerns. They match/fit with my existing dining table, and complete the set.